I just stumbled across this interesting art installation by David Byrne (I first discovered this on Walrus Audio’s Facebook page). 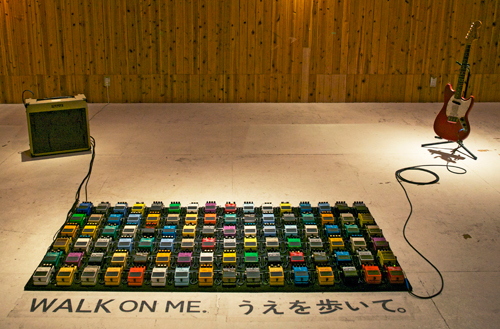 It’s an interesting art installation of 96 Boss pedals in a grid and all wired in series, with a RC-3 loopstation as the first pedal to provide a simple loop signal to the rest. 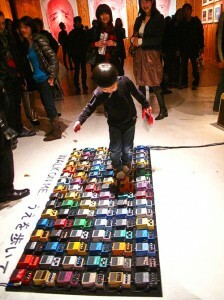 Participants can walk on the pedals creating their own sonic result. For more information, check out David Byrne’s page. The photo above and below are from Tokyo VACANT gallery, December 2010. Here is a great shot of the pedal grid in action. Looks fun, my kids would go nuts on this. This could be great testemant to the durability of the pedals.